Who knew that a trip down the Middle Fork of the Salmon River would bring a new verb into my vocabulary. 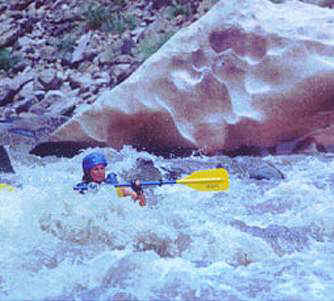 "Duckying", as in "to ducky," means to run a river in a rubber kayak  by oneself. Well, I usually duckied by myself  except when the Mountain Travel Sobek river guides scooped me out of the water after zigging when I should have zagged. Duckying, I discovered, is an incredible adrenaline rush. just like ducks behind Mother Hen. Running Salmon River rapids in a "ducky"
Photo credit: Peter Guttman Over the course of the week, everybody tried a variety of boats and most settled on their favorite means of transport. For myself, I preferred the ducky. This could speak partially to the control freak in me, for I loved being the captain of my little tiny craft. Every time we would get to the top of a rapid, my heart would start pounding in anticipation. 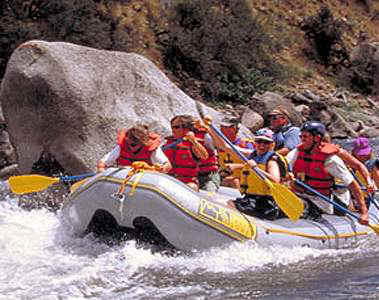 And then, with excellent instruction from our guide, one by one we would follow the paddleboat down the rapid. And that is when I would start paddling for "all get out" trying to follow the right line behind the boat. It was also in those moments that I found myself having my own personal little coaching sessions, alas, out loud. "Okay, you can do it. You will not fall in. You will stay in the boat." Hopefully, not too many people heard my monologues but they certainly helped me come through the rapid with an exultant "whoooeeee". Ok, sometimes I didn't exactly stay in my boat the whole way. It's a bit of a tricky balance issue. But with my life vest and helmet and my feet pointed down stream, I always came up laughing. I was back in my boat or yanked out by one of our guides in a matter of moments. What a rush. Life on the river was great. Whether we had an adrenaline-charged "ducky" day or one spent lounging lazily on the oar boat, we all ended up blissfully in camp each evening exchanging stories. As we lounged in our camp chairs, engaged in lively conversation with a glass of wine or a beer in hand, the afterglow of sunset played upon the river and a fire roared at our feet. Yes, this was heaven. Robyn Gorman is Mountain Travel Sobek's Marketing Director. Courtesy: Mountain Travel Sobek [Mountain Travel Sobeks "Middle Fork of the Salmon River" adventure is one of the finest rafting experiences in the world. 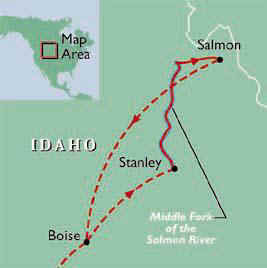 The Middle Fork boasts more than a hundred rapids in as many miles. This translates to awesome whitewater rafting fun, but there are many other requisites that make rafting the Salmon River a "classic": world-class guides; spectacular scenery and wildlife; hikes up side canyons; soaking in natural hot springs; fishing to your heart's content; getting a glimpse of the past, from old homesteads to Indian pictographs; and on most departures, riding the waves in inflatable kayaks].